MM 1/c Warren G. H. Cupp, son of Issac Cupp, attended Frederick High School; husband of the former Jurhie Godfrey. 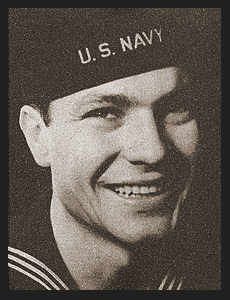 Entered the Navy in Sept. 1942, trained in Great Lakes, Ill., Boston, Mass. ; served in Bermuda, Cuba, Iceland, Guam, Midway, Iwo Jima, Newfoundland, Panama, Honolulu, the Marshalls, the Philippines, Saipan. Awarded Am. Theatre Ribbon, EAME Ribbon, Asiatic Pacific Ribbon with four Battle Stars, Philippines Lib. Ribbon with two Battle Stars.